Honestly, there is not a lot to share as this was a serious driving day. Every time I make this drive I call it – Miles and Miles OF Miles and Miles. The scenery changes as the miles pass. The hills around Yakima are totally barren. You realize when you’re close that it has some scrub brush, but from a distance it just looks empty. Then the trees increase from near Spokane to the border. Northern Idaho is back to forest. It’s dryer than the West Coast, but you drive winding roads through tons of evergreens. Then it starts opening up and by the time you’re 1/3 of the way into Montana, it’s back to scrub brush. We stayed this night in Butte, Montana. 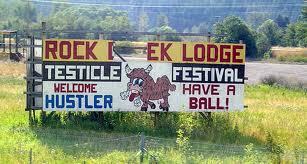 The only funny note along the way was this sign we saw along the freeway for the Testicle Festival in Clinton, Montana. Had to look it up that night in the hotel and nope - wouldn't go. Still pretty funny. Left dryer area around Spokane - Right on I-90 through Northern Idaho. From straight roads to mountain curves. From dry to lush forest. From Butte we drove into Yellowstone National Park. Not too far from Butte you leave the freeway and move onto two line roads with occasional tiny little towns. Very isolated houses were dotted here and there along the way. We saw Eagles, Pronghorn Antelope and Sand Cranes as we drove. There were three highlights, but one topped them all and I’ve saved it for last. First were several telephone poles with platforms placed on top. They were used by eagles to build nests. I saw two large nests along this route with a watchful eagle standing guard at each. Second was a crazy handmade LARGE radio build out of metal outside business in the tiny town of Norris. It had to be 5 feet high and 6 feet wide and very detailed. Glen didn't slow down for me to get a picture and unfortunately I can't find one in a web search. Now for my hands down favourite. As we drove from?? to Yellowstone’s east gate, traffic stopped dead. We were in a line of three vehicles with a big delivery truck in front of us, so it took a bit of time to see what the problem was. Then we started laughing. Two men on horses and three sets of people on ATV’s were moving a large herd of cows up the road. To get past them the lead vehicle had to start slowing moving forward down the middle of the road, diving the herd in two and pushing them into the ditches. OH MY! The cows hated moving off the road and hated being separated. If you left more than a little distance between you and the car in front, mooing cow would try and squeeze through. If we had not had such a big vehicle in front of us, this would be a better video, but it’s still hilarious! Honestly, noon is not the best time to arrive at Yellowstone during prime season, especially if your first stop is Old Faithful. This site is crazy busy and the parking lot a rush hour puzzle. There is also no way to park outside and walk in, so you just have to brave it. Fortunately, so many people are coming and going from this site constantly, if you have patience, a spot will open up. We were lucky to get one right away. Working on getting this video of Old Faithful turned! What I want to do now is share the sites we stopped at this day, but just a brief description with notes on access. Then pictures and/or a video. You can look up descriptions with the links included. Old Faithful – This is really a personal choice. The first two times I viewed Old Faithful it was from right up close. There is a bunch of surrounding the base of the geyser and then more back in the trees (better on a hot day). The frequency has changed over the years, but it currently erupts about every 90 minutes and the average height is 44 metres. This time around we decided to walk out into the geyser basin (a wooden boardwalk over a larger thermal field) and pause at a distance to watch the eruption. I actually loved this view and loved not being in a crowd. If you can make time for both close up and far away, that is the best of both worlds. The ground around geysers is very unique and feature Bacterial Mats, that are alive with microorganisms. We walked a bit of a larger loop. We walked Geyser Hill and half way around took a side loop that added in the Castle Geyser section. While there are geyser spouts through all of this, some are just boiling cauldrons others only erupt sporadically, so you just never know when you’ll get to see something. I have several photos and videos below. The most interesting part of the lower section is the Castle Geyser. The cone is extremely high compared to Old Faithful. The reason? Old Faithful is only several hundred years old and Castle is thousands of years old. I would have love to see it erupt. Last but not least, take a moment and walk into the historic Old Faithful Inn. It really is beautifully preserved. They have lots of open log construction, several floors surrounding the open atria you can look down from and all the lights have bulbs that give the impressions of candles. Black Sand Basin – Took some nice pictures here, but honestly couldn’t see the black sand. Midway Geyser Basin – This is a must stop but it’s nuts. The parking lot is a quarter of the size it needs to be during high season. Park on the road and walk it. Then be aware. There are several things to see on this loop, but the prize is at the top. It needs to be a sunny day and the sun needs to be high in the sky. A small breeze is an added bonus. It’s called the Grand Prismatic Spring. I have a video so you can see how beautiful it is. I've also included several images of the amazing variety of bacterial mats that surround it. This spring was my hands down favourite site in all of Yellowstone. It’s a large hot spring with steam rising off of it. The sun shining through the steam creates a prism at the edges. Around it is a bacterial mat with all kinds of different coloured organisms growing. The video is the best for the view, but I have photos as well to show cools grounds. Artists Paintpots – This was our last stop. I think we would have enjoyed it more as the first. After the Grand Prismatic Springs, this seemed very low key. It’s a nice walk and then if you climb, you’ll see some mud pots bubbling. Below I have a photos of the lower area and then a video of the Paintpots. We had an amazing day filled with wonderful experiences, but the driving, the sun, the heat and the crowds really took it out of us. It was great to check into our really wonderful hotel in Gardiner – The Rodeway Inn. A couple brewski’s in hand we luxuriated in the large suite with livingroom, kitchen and separate bedroom. AAAHHHH! Be sure and check the next in this series for my road trip AND visiting Yellowstone in high season tips.